Handstand pushups are a phenomenal exercise. Unfortunately, most people don’t make a serious effort to improve their handstand due to the challenge. Maybe you don’t like being upside down, maybe you’re worried about looking silly, or maybe you’re worried about hurting yourself. But if you persevere, you’ll be rewarded with one of the best exercises you can do. Now, what do I mean by the title of this post? What’s a “true” handstand pushup? Well, most gym-goers (heck, most trainers and coaches) confuse the headstand pushup with the handstand pushup. The exercises are the same except for the range of motion. A handstand pushup requires your hands to lower all the way to your shoulders, a full range of motion. This means you’ll need to use something to put your hands on: rings, parallettes, parallel bars, chairs, stacked weight plates, aerobic steps, and benches all work as ways to increase your range. Now, a note of warning: IF you’re scared of falling, work with a coach and spotter to get you over your fear. Hesitation in an exercise will lead to form breakdown and possible injury. Get totally comfortable with kicking up into a handstand, wall walks, and pike pushups before working on headstand pushups. And if you’re not yet able to do regular pushups with good form, master those first before moving on to handstands. First step to a handstand is to get your shoulders warmed up right. I start every handstand workout with at least 20 reps each of the YTWLI Shoulder Fixer series, foam rolling for the back/chest, and a few regular pushups. I’ve been to gymnastics for adults seminars, I’ve got books/courses/DVD spilling off my shelves, and I read training info all the time. And guess what? No one has agreed on the perfect method of teaching the handstand/headstand to everyone. So what I’m going to do is share a list of exercises in a rough progression from easiest to hardest, and tips for each. Find what works best for YOU. Just be consistent and diligent in your training and you’ll be surprised how fast you will make progress. The exercises are grouped into three sections. First is headstand pushup progressions, then handstand pushup progressions, and finally a mix of moving handstand variations. When you do these correctly, you will develop shoulder, core, and arm strength without being crushed by your full bodyweight. Put your feet on a box (ideal height for the box: feet are horizontal with the hips when your hips are piked 90 degrees and arms are straight). Make sure that your hips are in line with your shoulders. Now just bend your arms and touch the top of your head to the ground between your hands, then return to starting. Common mistakes are letting your shoulders get out of line with your hands, letting your hips fall out of line (then the exercise becomes more of an “incline press” than a “shoulder press”), and not keeping your head between your arms. Variations/progressions for this exercise: shortening the range of motion by bringing head to mats between hands (instead of all the way to the floor), having only one leg supported by the box, placing feet on large swiss ball, using one foot on swiss ball. This exercise will help you get over your fear of being upside down, and will help you build the body awareness you need to progress in your handstand training. After you have done a few sessions with this exercise the upside down position will be nothing to fear and you’ll be able to concentrate on the strength and form of your handstands. Start in a modified sprinter position with your hands about 2 feet away from the wall and shoulder width apart. Have one leg bent and the other almost straight behind you. Now, just kick up into the bent leg handstand by pushing with your bent leg and swing over your straight leg. Kick hard enough to swing you all of the way over until your feet touch the wall. Put a lot of force into your kick-over. Most handstand newbies won’t put enough umph into their efforts. Use enough to swing you over (just don’t smash a hole into the wall). As you gain more body awareness, you’ll be able to kick over perfectly and just lightly touch your foot on the wall. VERY IMPORTANT: Keep your arms locked the whole time you’re kicking over. It’s tempting to bend your elbows and roll into a ball instead of pushing yourself into the strange new world of being upside down. Locked, strong arms will help protect you from injury. Bent arms collapse more easily… which can lead to a bump on the head. Use a spotter if you can find one. Have them stand just to the side of you while you’re in your “sprinter start” pre-kickover stance. They can put one arm under your hips and gently guide your feet back to the ground if you don’t kick had enough or your arms start to get tired. Practice this until kicking up is second nature, when you have no fear of going upside down. I like to switch which foot I kick with each practice set. You can progress by adding more reps (more times kicking over), by holding the position longer, or by straightening out one leg. Since you can now easily kick over into a handstand against the wall, your next step is to work on your form. This next variation is more difficult because you’ll put more weight on your arms, core, back, and shoulders and less into the wall. First, kick up with your legs bent and then straighten them both out against the wall. Now try to straighten your body out as much as possible. Next, kick up and straighten both legs as you go around, keeping them straight as your feet land against the wall. Keep working at it until you can keep your body straight from hands to heels (this is difficult because your hands are away from the wall). Progress by doing more reps, and spending more time in the handstand. This is a lot like exercise #3, except that you’ll start with your hands closer to the wall. The reason this is more difficult is that you’ll be supporting a higher percentage of your bodyweight and have to develop more balance and body awareness. As you get comfortable, progressively move your hands closer to the wall until your fingertips are touching it. Make sure that your back is as flat as possible and you aren’t bent at the waist. Again, add more reps and more time in the handstand position to progress. Wall walks are different for two reasons: you won’t be kicking over and instead of your back to the wall, you’ll have your chest to the wall. Start in pushup position with your feet against the wall. Now walk up the wall with your feet and walk your hands back towards the wall. Keep your body tight and walk up as far as possible. If you need to bail out, just bend your arms and somersault forward. This is a great training tool because you’ll be developing more strength in your arms, shoulders, and core as you move. Practice until you can touch your chest and your nose to the wall, then you can progress by adding more reps and spending more time in the handstand on each rep. This is THE exercise for building strength in the headstand. Simple and effective. From a wall handstand (with your back to the wall), simply slowly lower the top of your head to the ground. The slower you go, the more strength you’ll build. When your head touches the ground come down off the wall, straighten your arms, kick up, and do it again. You can progress by adding more reps and going more slowly. Adding some movement to the the handstand will make it harder to keep your balance. On this exercise, the closer your hands are to the wall, the more difficult it will be. Kick up into a handstand against the wall. Now walk yourself sideways along the wall using only your hands and arms. Spread your legs for balance if you need to. And remember to travel the same distance in both directions to avoid imbalances. Progress in this exercise by adding more distance to each walk. A fun way to do these (especially if you have a short wall), is to go back and forth for time. In this case, add time to the set as you improve. Example: 3 steps left, 3 steps right, repeat for 45 seconds. Kick up into a handstand against the wall. Now do the top 1/4 of a handstand, just a few inches in the range of motion. A good starting point is 4 sets of 5 reps. Add both sets and reps until you can get a total of 30 reps each training session. Once you can do 3 sets of ten reps you can move on to the next exercise. Like exercise #8, except you’ll bend your arms halfway. You’re finally there! A headstand pushup! This is the full headstand pushup, where you kick up into a handstand, lower the top of your head to the floor, and press yourself back up. Make sure that you keep your torso tight, as it’s easy to lose your balance on the way back up. Now that you’ve gone as far down as possible with the headstand pushup, it’s time to extend the movement. In order to increase the range, you need to start elevating your hands. Aerobics steps with risers are the perfect tool for this, as you can incrementally increase the depth of your handstand pushups. Stools, benches, or high parallettes work as well, though it’s more difficult to grade yourself on depth. If you’re using parallettes or steps, use panel mats or a stack of books between them to act as a substitute “floor.” As you get stronger, remove a book and go deeper. In order to increase your strength over the full range of motion, you’ll want to take small jumps instead of big ones, since only a few inches deeper will make the exercise substantially more difficult. A good basic guideline is to try and increase by one inch each month – this will allow you to completely master the movement. Place you hands on a low steps shoulder width apart, kick up into a handstand, and perform slightly larger range of motion handstand pushups. You can progress these by adding reps or adding depth. Use higher blocks or two benches shoulder width apart. 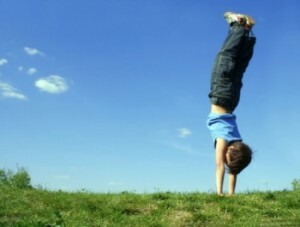 Place your hands on them, kick up into a handstand, and slowly lower the top of your head to the ground. Come down, straighten your arms, then kick up into another handstand for your next rep. These are good to mix in with handstand exercise number 1. While you work on increasing the range for your full movement, build full-range strength with the negatives. Progress the negative full range pushup by going more slowly and by adding reps.
Place a cloth on the ground between your handstand boxes. Now, when you do a handstand pushup, pause long enough to bite the cloth and push yourself back up all the way. This is a brutal exercise because you lose any muscular rebound while you pause in the bottom position. Progress on these by adding more total reps (not by using a heavier cloth!). Perform just like handstand exercise #5 above, but use an underhand (supinated) grip. This will help you build the strength you need for doing handstands on the rings later. Using gymnastics parallel bars or parallettes, kick up into a handstand with your hands about 45 degrees offset from each other. Descend into the handstand pushup and let your elbows flare out to your sides. Return to handstand to finish the rep.
Set your gymnastic rings close to the ground, this will make it easier to bail out than if you are six feet up in the air. Place your hands on the rings, set your arms, and kick up into your handstand with your legs straddled slightly in order to catch the straps. Lightly wrap your feet around the straps and perform your full range handstand pushup. Initially, the added difficulty of being on the rings will make it unlikely for you to perform a full range pushup from the position. Go as deep as you can and use negatives (like exercises 1 and 2 in this section) until you can do a full range handstand pushup with your feet on the straps. Progress by adding reps (and working on perfect form!). Kick up into a regular ring handstand. Now as you lower yourself down, let your arms go out wide. On the way back up pull the rings back into starting position. 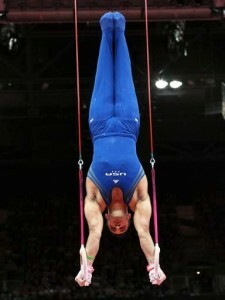 This is like exercise 7 above, except your feet aren’t sliding up and down the straps, you’re freestanding on the rings. The intensity of this exercise is incredible, as the rings are unstable as hell. Kick up into a handstand on the rings. Now remove your legs from the straps and turn your hands outward (this is why you mastered the underhand grip handstand pushup in exercise 5). Keep the straps clear of your forearms. Lower yourself into the bottom position under control, allowing the rings to turn inward as necessary. Pause, then press back up into the handstand. At no time should your legs or feet touch the straps. Progress by adding reps and perfecting form. A fun way to train handstands is to add movement. Handstand walking is just the beginning. Stairs, hopping, and obstacle courses can all be done. These aren’t really progressions, just a variety of exercises you can add into your training. Movement adds a lot of balance and coordination to your handstands. This one is simple. Kick up into a handstand and have a partner catch your feet. Now just walk forwards and backwards with your spotter just helping you balance, not taking your weight. Progress by adding more time walking forwards and backwards. Just like exercise #1 above, except this time you’re on your own. Kick up into a handstand and walk around. Just like exercise #1 above, except you move by doing a partial pushup and “hopping” yourself forwards and backwards. Variation: Keep elbows locked and hop with just the shoulders. You won’t go as far, but it develops great shoulder strength. Moving Handstand Exercise 4: Unsupported Handstand Hop Walks. Same as exercise #3, except you don’t have a partner helping you balance. As you get more advanced, you can do these unsupported, but for now do them against a wall or with a spotter. Kick up into a handstand in front of a low platform. Now, raise your right hand and place it on the platform. Now push hard through your right hand and bring your left hand up to the platform. Finish pressing up if you haven’t already. Now reverse the motion to come down. You might find that one side is significantly easier than the other. Train the harder side more often! Maybe an extra rep or two each set – this won’t make you unbalanced, rather, it will bring you back into balance and improve all of your other handstand exercises. Progress by adding reps or by stepping up to a higher platform. This one is fun! It’s the handstand version of the chest tap pushup. These can be done against the wall, with a partner spotting your feet, or freestanding/unsupported. Kick up into your handstand. Now shift your weight over your left hand and touch the top of your head with your right hand. Repeat other side. As you get better at these you will minimize side to side movement waste and be closer to performing a one-handed handstand. Progress by adding reps and removing balance support. These are handstand step ups taken to the next level. Start with a spotter and progress to doing them unsupported. It’s easier to go down the stairs, so start with that to build comfort. After that, see how many stairs you can climb in your handstand. You can either lead with one hand for the whole set and switch next set, or you can alternate hands at each step. Headstand pushups, handstand pushups, and moving handstand will transform your upper body. You’ll gain strength, endurance, balance, coordination, and confidence.